Any business owner knows the importance of brand recognition and identity, but many forget that extending the company’s logo to employee uniforms can help with both. Logos are a quick and easy way for customers to recognize your business and services. By adding your logo to employee uniforms you can help create not only a more consistent brand but a more professional image. At Chesapeake Uniform we know just how important uniforms can be and we take your image seriously, which is why we highly recommend adding your logo to your company’s uniforms. Have you ever walked into a store or shop and not been able to tell customers from employees? 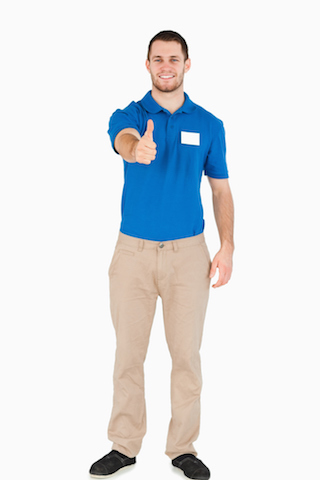 Having employee uniforms with logos not only builds a professional, polished image, but it makes it easier for customers to identify who to speak with. Customers often recognize logos over names, meaning that having your logo more visible is vital to attracting and retaining your customer base. Logos make it easier for customers to tell the difference between the real deal and off-brand services. By adding logos to your employee uniforms you’re going the extra mile to ensure customers know who you are and what you do. Plus, having consistent uniforms with logos can help build a better work environment for your employees. Uniforms with logos help to build a sense of team and community, but also make your employees more invested in the success of the business. Any time you or your employees are out on a job or popping into a grocery store could be an opportunity for free advertising. If you use uniforms with logos you can attract new clients without any extra effort! To give your business a clean, professional, and cohesive look, rely on Chesapeake Uniform. Whether you want to get simple uniforms or add your logo to what you already have, our team is ready and willing to help you with all your uniform needs. We have served the Maryland, Delaware, Washington, D.C., Virginia, and Pennsylvania area for over 30 years with quality uniform rental services. We can provide you with the uniforms you need for the price you want. Give us a call at 410-558-3360 or visit us online. To see examples of our work and learn more about our services, follow us on Facebook, Google+, Twitter, and Pinterest.